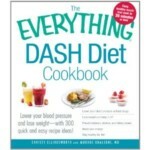 ← The Daily Dish is on Facebook! My husband & I are in the process of cleaning out our attic. Attics tend to be places full of things you don’t want to part with, yet rarely use, and in our case this includes countless boxes of cookbooks. Yes, I am a long-time cookbook collector and back before we left Philly, this collection culminated in a one-time SUPER SCORE of ten whole BOXES of cookbooks!! Although the move forced me to thin the ranks greatly, I’ve kept hold of dozens. But increasingly I find myself storing them away in favor of the internet. Googling an ingredient and finding a world of recipes is just so efficient and worlds easier than thumbing through box after box of dusty old cookbooks. Though, truth be told, there’s something I love about that too. Anyway, today’s Eating Well recipe came to me via Twitter. The jury’s still out on how I feel about Twitter but I sure do love spinach, especially in warm salads, and the two words MAPLE SYRUP bring stars to my eyes. So when the recipe popped up last week I said OH YEAH and printed it out in a flash. I made this last night for dinner. It was easy, fast, and absolutely delicious. 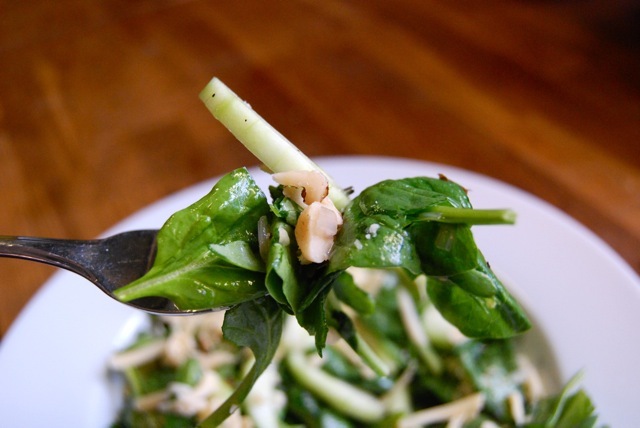 The warmth of the dressing serves to semi-wilt the spinach, so if you’re someone like me and actually prefer cooked spinach to raw – it’s a best of both worlds scenario. The vinaigrette, a combination of sauteed shallot, cider vinegar, the aforementioned syrup, olive oil and black pepper, sounds deceptively simple but the level of flavor is out of this world. Next to no sodium and SO good. We happen to have a block of smoked Gouda (the hubs is a BIG FAN) but if you’d like to reduce the sodium further, simply opt for shredded Swiss cheese or eliminate it altogether. If you’ve never seeded a cucumber, first peel, then cut lengthwise into two halves. Use a spoon to gently scrape down the middle and remove seeds until clean. 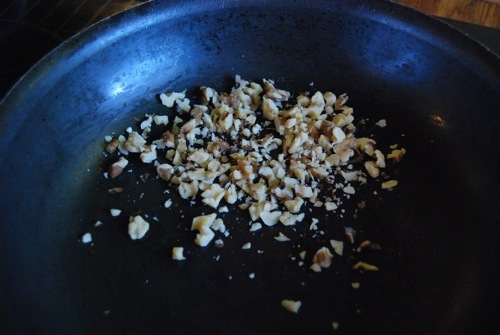 Toast the chopped nuts in a small dry skillet over low heat, stirring often, 2-3 minutes. Remove from heat, transfer to a small bowl and set aside. 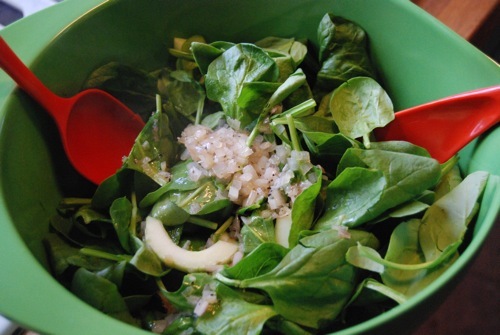 Toss spinach and cucumber in a large bowl. Heat oil in a small skillet over medium-low heat. Add shallot and cook, stirring, until softened, about 4 minutes. Add vinegar and maple syrup and bring to a boil. Season with freshly ground black pepper to taste. 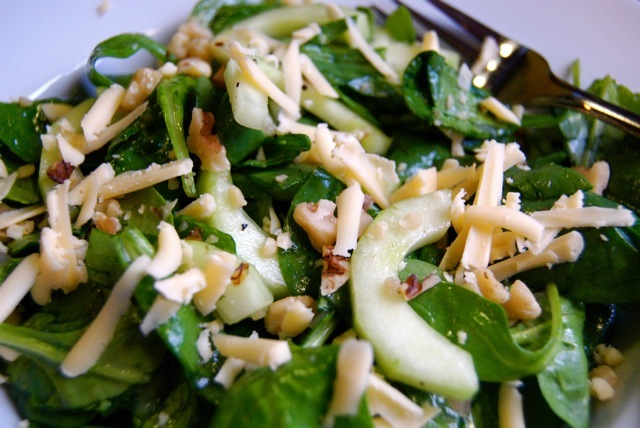 Immediately pour the dressing over the spinach and cucumber. Toss well and sprinkle with cheese and toasted pecans. 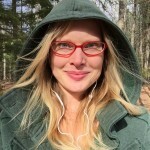 This entry was posted in Salads and Dressings, Vegetarian and tagged Eating Well. Bookmark the permalink. Spinach and cheese?! How can you go wrong?! I think I ate an entire block of smoked Gouda once. All by myself. In one sitting. I cannot believe those maple bacon sundaes are for real. I thought they were just an April Fools prank or something – like when Whole Foods kept advertising “the tiniest, most humane meat ever” – aka BUGS. I will have to see those for myself. 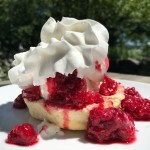 Better yet — I will just read your blog post and save myself the gut wrenching heartache of having to stop at 2 bites. Inky, you & my husband would get along FINE. Christy, the dressing sounds fabulous. 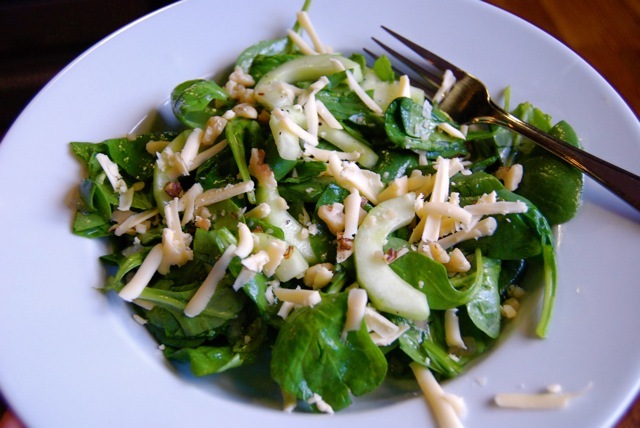 Similar to the flavors of wilted spinach salad dressing with bacon. I love bacon but sometimes don’t want to fuss with cooking it. This would be a good alternative. I buy low sodium bacon at Costco (3 to a pack), cut the packages in half and then freeze the halves. But sometimes I’m way to lazy to even thaw and fry up half a package. Thanks for the recipe.